Update: Jackie M’s restaurant in Concord has closed. 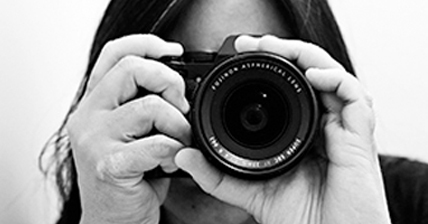 But Jackie’s still cooking up a storm – find out more at the Jackie M website. This dinner is special because 1) we’ll be meeting and dining with Internet friends and fellow bloggers Craig and Caroline for the first time and 2) we’ll be eating at Jackie M’s restaurant. I’ve been chatting with Malaysian-born Jackie online on Twitter and Google+ for sometime and have been drooling over other food bloggers’ write-ups about her restaurant ever since the Malaysia Kitchen competition that resulted in my winning the trip to Kuching – I’ve been really looking to meeting her in person. We’re all starving and order up a feast to share. As the food arrives, it’s only natural for our cameras to make an appearance too, with no explanation necessary as we pass dishes around so everyone gets the chance to photograph everything before we dig in. 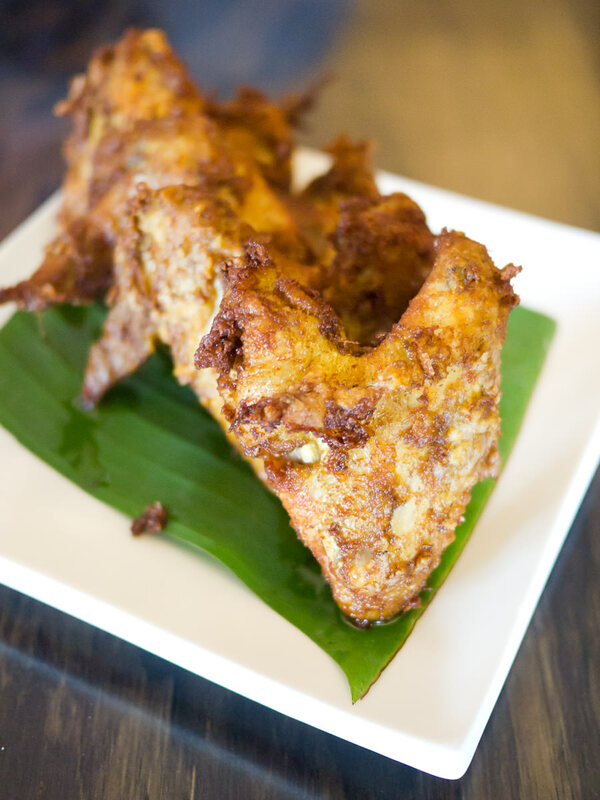 We’ve ordered a serving of ayam goreng (AU$12 for 4 wings) – Malaysian fried chicken, one of my favourites. The chicken wings are served popping fresh and hot, coated in a tasty super-crunchy batter. 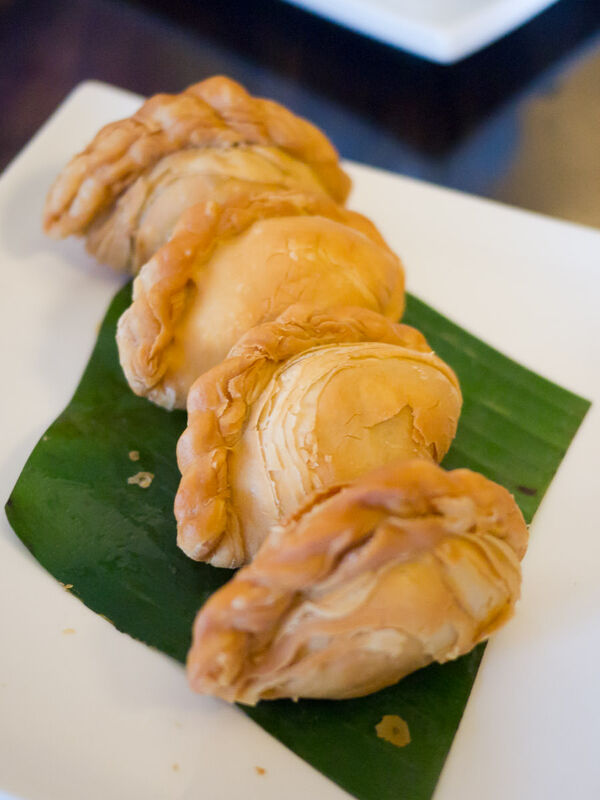 The curry puffs (AU$12 for 4) are filled with meat curry (vegetarian filling also available), with hand-rolled flaky, crisp pastry. Jackie makes her own roti from scratch and it’s fluffy and buttery. 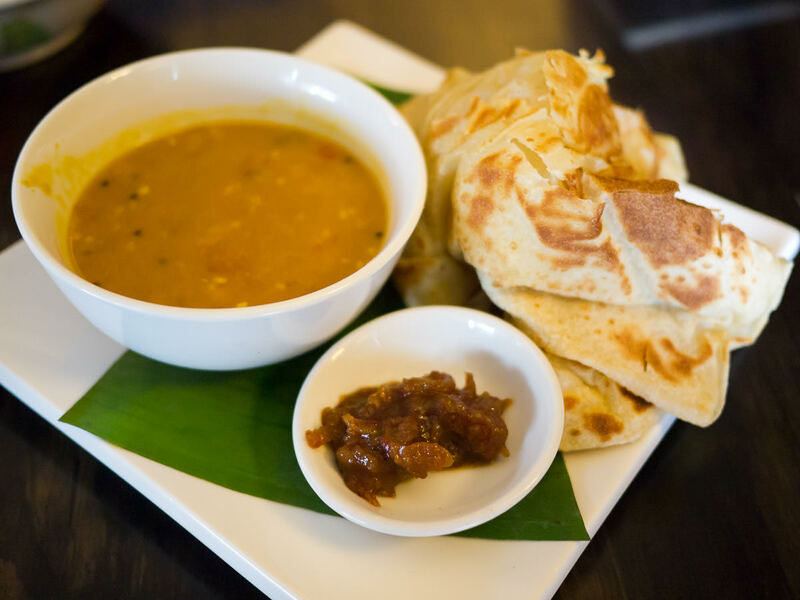 The roti canai is served with a selection of dips – tonight, it’s Jackie’s housemade dhal and sambal. 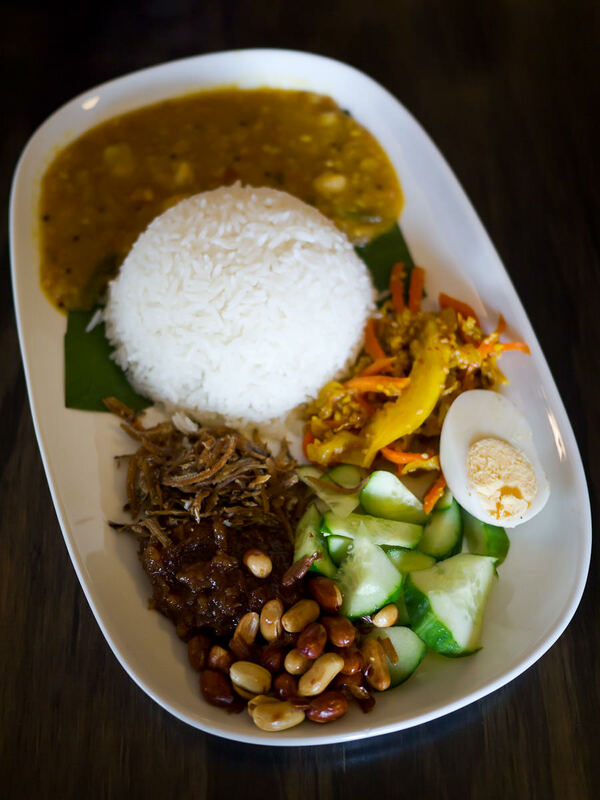 We also share a serving of nasi lemak (AU$15). Jackie’s nasi lemak includes coconut rice and generous amounts of achar (pickled vegetables), fresh cucumber, hard-boiled egg, peanuts, ikan bilis (fried anchovies) and spicy sambal. 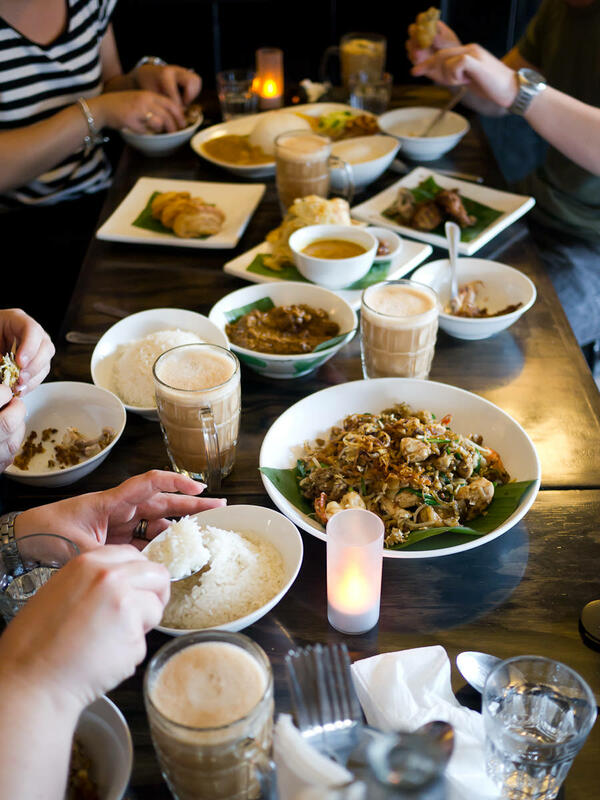 For $5 you can add beef rendang, chicken curry, lamb curry or dhal – we choose dhal. The beef rendang is one of the best I’ve eaten in a restaurant and right up there with my mum’s. 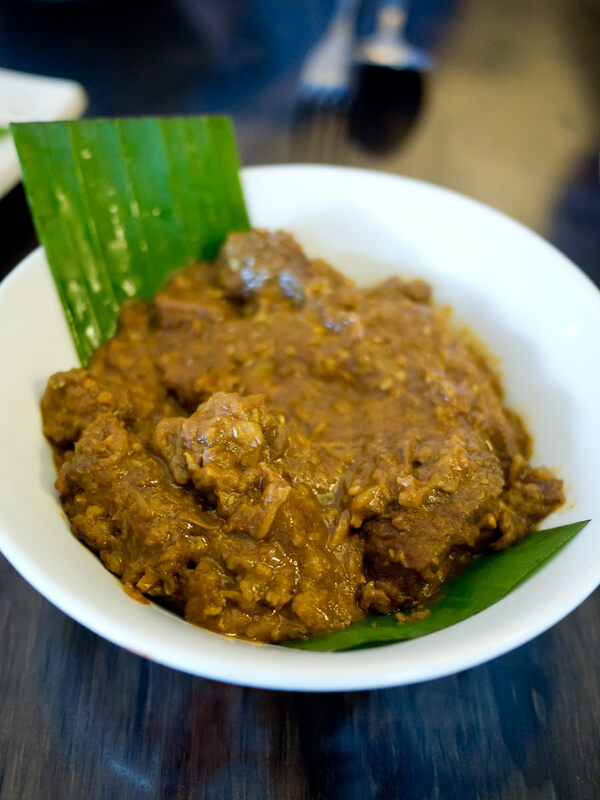 The slow-cooked beef is so tender and the gravy is delicious, complete with toasted coconut (“kerisik” in Malay) for an authentic flavour and texture. It looks ugly but tastes magnificent and is the dish I dream about long after the meal is over. 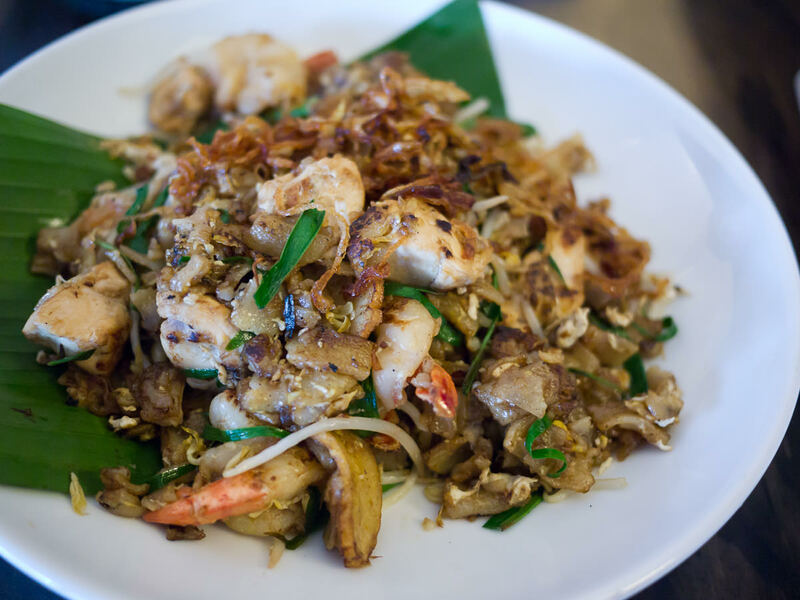 We order char kway teow with the lot (AU$14; add chicken $4; add prawns, calamari and fishcake $6). It’s loaded with goodies, with the delicious charry taste of a good hot wok. 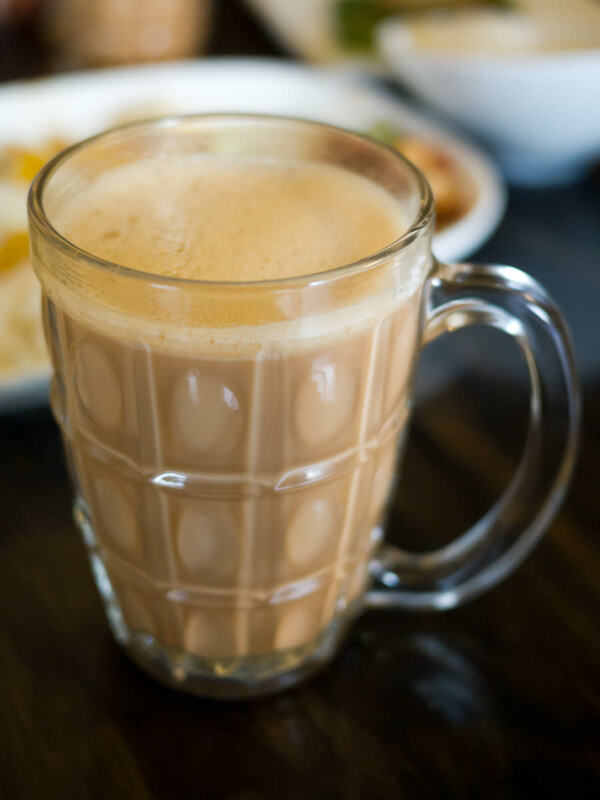 We wash all of this down with mugs of milky hot teh tarik (AU$3.50). We order extra bowls of coconut rice (AU$3.50). It’s so moreish that I get perilously close to filling up just on coconut rice. Everything is delicious and we are in heaven – Jackie’s a marvellous cook. I’ve made some lovely friends through my blog and the Internet. Craig and Caroline love food, cats and photography and like me, spend much of their lives online, so we have a lot in common and always have plenty to talk about. 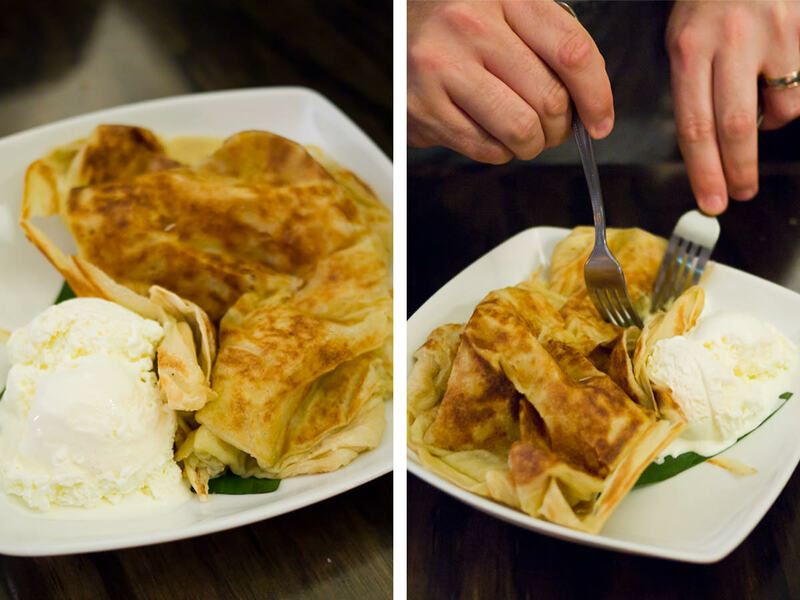 For dessert, we order a single serve of roti kaya with ice cream (AU$8.50) to share. Inside the buttery roti is kaya, sweet pandan coconut jam. Craig carves the roti into five bites and within minutes, it is all gone. After dinner, Juji and I nick out the back to thank Jackie for a wonderful meal and have a quick chat. Over this past year, I’ve had more opportunity to talk with restaurateurs and chefs about their food and convey my appreciation in person as well as online. I think it’s important for us to talk more – although we may sometimes appear to be working on different sides, ultimately, we’re all driven by our creativity and passion for food. It’s great getting to know the person behind the fantastic meal we have just demolished. Jackie thinks it’s awesome we’ve come to Sydney with an eating agenda. Hope to see you in Perth sometime, Jackie! 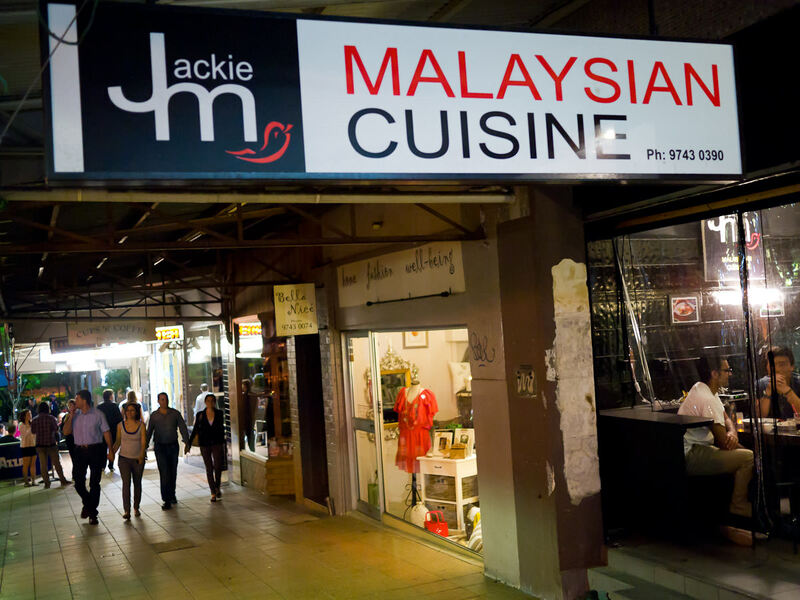 Jackie M Malaysian Cuisine is currently closed for the festive break, reopening on Saturday 7 January 2012. The restaurant is usually open Thursday, Friday and Saturday 5-10pm – check her website for up-to-date info on opening hours. Like Jackie M on Facebook or follow Jackie M on Twitter for get the inside word on specials. Get Jackie M food at selected markets and buy curry pastes, sauces and frozen packs at Jackie’s online store (limited delivery areas). Get recipes and watch videos at Jackie’s blog. See the list of posts so far, in reading order. There’s a whole lot more to come, including more eating out with Craig and Caroline. Also see Juji’s post and Craig and Caroline’s post about Jackie M Malaysian Cuisine. Thanks for all your kind words during Billy Lee‘s time in hospital and since her passing. Your support’s helped more than you probably realise – thank you.